Over the last 3 months, the average BDC stock price has declined by over 10%. However, the declines started in early September due to investors seeking higher yields. 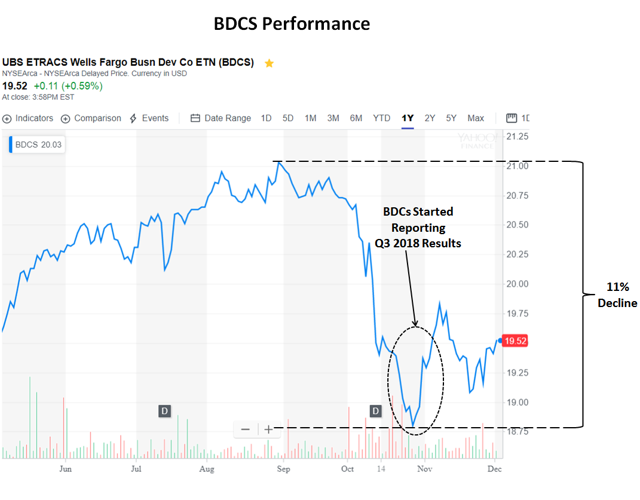 BDCs started to rally as many reported strong Q3 results, followed by another decline that could have been partially due to tax-loss harvesting and could keep prices lower through mid-December. This creates an opportunity to take advantage of potential gains as ‘discount reversion’ takes place in the early part of 2019 helped by the ‘January Effect’. I will be updating the Upcoming BDC Buzz Purchases report later this week to take into account the Q3 2018 reported results, identifying the BDCs that I plan on purchasing before the end of the year and what I am looking for before making purchases. Tax loss harvesting is the practice of selling a security that has experienced a loss. By realizing, or “harvesting” a loss, investors are able to offset taxes on both gains and income. The sold security is replaced by a similar one, maintaining an optimal asset allocation and expected returns. The following table shows the change in stock prices before BDCs began reporting Q3 2018 results in late October 2018. Continued lower prices in November/December could lead to greater opportunities as more investors use tax-loss harvesting strategies to realize losses for the 2018 tax year. This creates an opportunity to take advantage of potential gains as ‘discount reversion’ takes place in the early part of 2019. The January effect is a seasonal increase in stock prices during the month of January. Analysts generally attribute this rally to an increase in buying, which follows the drop in price that typically happens when investors, engaging in tax-loss harvesting to offset realized capital gains, prompt a sell-off. Another possible explanation is that investors use year-end cash bonuses to purchase investments the following month.